Several themes have run through this book. Social work is a stressful and difficult, if not impossible, profession. Practitioners are required to work within disturbing, sometimes violent situations, with people who are severely disadvantaged and deprived materially and emotionally. Social workers regularly confront practice dilemmas; the necessity of having to take difficult decisions, in which there are no right answers, based on a delicate assessment of risks, needs and competing (if not conflicting) rights; and a myriad of pressures, including from within. 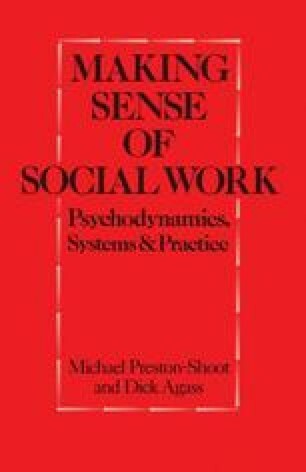 The result is a complex maze and interaction of personal, professional, interagency and societal dynamics and pressures, and potential tangles between service-users, social workers, agencies and society. Figure P.1 attempts to represent diagrammatically how this complexity can lock all the participants into a closed system, individually and interpersonally, within and between. Workers bring to the task their personal and professional experience which may, via transference and projection, disrupt the helping encounter. What clients bring may trigger and provoke reactions in the workers (countertransference). Finally, societal attitudes — for example, ageism, intolerance of difference, conflicts in explanations for child abuse or heterosexism — are avoided or deflected through social work.